We all have a powerful tool in our pocket, capable of recording Hi-Res videos and even editing them together into short films for marketing or journalism that can be shared with the rest of the world. In just 1 day you will learn the tricks to get great shots, overcome the limitations of smartphones and increase the production values of your videos. 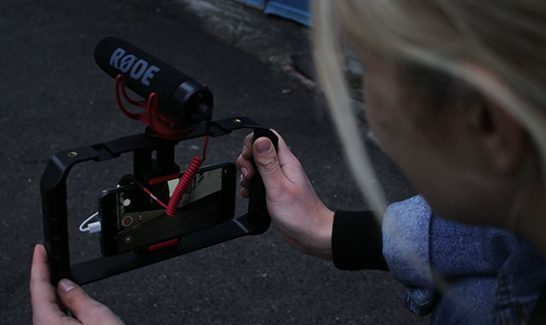 Our Smartphone filmmaking short course is addressed to marketers, journalists and documentary makers who want to use their smartphone to create and share videos on Social Media. The course will provide you with the skills and confidence you need to produce effective and engaging short videos on a low budget. We will present the key features of successful phone video making, demystifying the technology in a friendly and welcoming learning environment. Spectacle's Smartphone filmmaking course is a day packed with useful tips and techniques for getting the best out of your phone. You will have a chance to try out a range of extra equipment, accessories and apps. You will also learn good filming practices and handy editing workflows. Accessible hands-on exercises will help consolidate your new knowledge into ready-to-use skills and guide you into producing outstanding video. All our courses are led by Mark Saunders, a professional filmmaker with decades of industry and teaching experience. You get to try out a range of accessories and buying advice on what you really need and why. Complete beginners and people with basic video skills, from any background. There will be between 3 and 8 participants on each course. The aim of this course is to understand the principles of smartphone filmmaking rather than specific operations on any particular phone. We use iPhones to demonstrate and we will provide you with tips compatible with Android and Windows phones. You are welcome to bring your own handset to follow along instructions. As there are a myriad of smartphones, apps and operating systems, it would be useful to know your model and specs in advance.